During the sedimentation of the chalk, earthquakes occurred and some of them were violent enough to engender what we call séismites. By a seismic shock. A big variety of structures can be engendered according to the consolidation and the composition of the sediment. Most of the séismites described in the geologic literature interest detrital sediments, particularly alternations sand-clay for which he is convenient to analyze the geometry. In a sediment of tint homogeneous as the chalk, the possible seismic structures are more difficult to spot, except when in the chalk fit levels of flint. 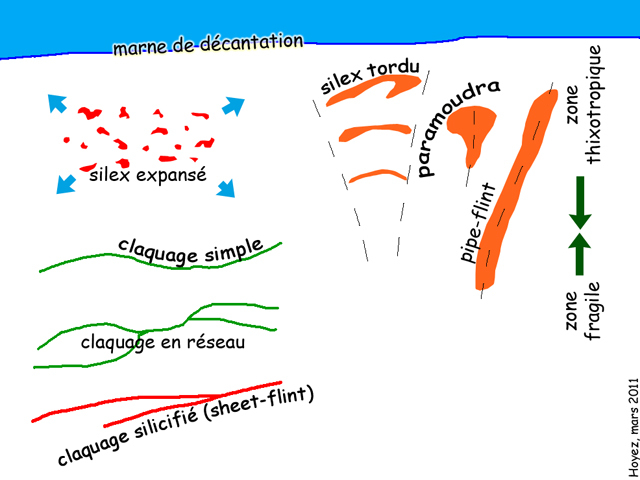 Chalks in the SW of the syncline of Ailly are in this case and it is mainly in this region that séismites is described here. Certain number of structures testifying of the action of an earthquake is specific in the chalk. They were described to Eletot or to Veules-les-Roses and can be gathered on this plan. Other structures as boudinage and synthetic break in rhombuses of flints can be mentioned. The séismite Escamet (above - Veulettes and infra-Michel Dean):Premier Avaleux, Saint Valéry W side E of the basin of the bunker.